At the ninth annual Michael J. 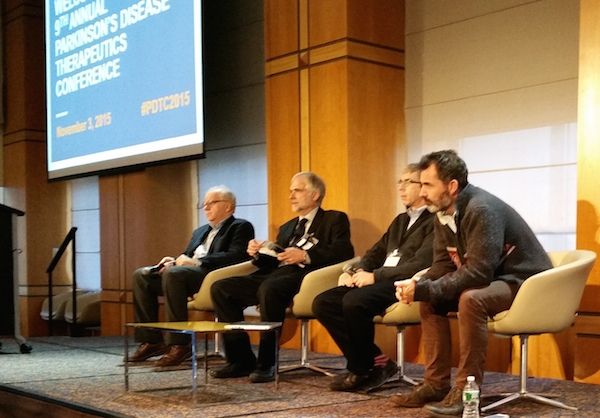 Fox Foundation Parkinson’s Therapeutics Conference in New York City earlier this month, more than 300 gathered to learn about a wide range of new experimental treatments and therapies. Always groundbreaking, this year’s conference didn’t disappoint, and offered attendees much to be optimistic about. 23andMe’s Paul Cannon, Ph.D., who manages our Parkinson’s Research Community, was there along with Linda Yu, Ph.D., a project manager in business development here, and other business leaders, researchers and scientists. There was a lot packed into one day, but Paul singled out a few presentations that he found particularly interesting. The first is a treatment that is now in the preclinical phase, a first step in the process of drug development. The treatment involves an innovative technique that implants cells into the brain. Those cells are engineered to express glial derived neurotrophic factor (GDNF), a protein that could help prevent or even reverse the loss of dopamine producing neurons due to Parkinson’s. Dopamine acts as a neurotransmitter in the brain and helps individuals regulate their movements, their body and emotions even. There is still much to be done, and an important next step in the process is a planned clinical study next year, the purpose of which is to make sure that this therapy can be safely administered to patients. Paul said that he was also struck by the unusual cooperation between three competing drug companies and The Michael J. Fox Foundation. The companies — Genentech, Pfizer and Merck — are all developing inhibitors of the LRRK2 kinase, the product of the well-known LRRK2 gene, mutations in which cause Parkinson’s disease in some individuals. An exciting feature of this approach is that it may also help all Parkinson’s patients, not just those with the deleterious LRRK2 mutations. The consortium members, led by the foundation, are sharing their compounds and data to work through safety concerns and understand the potential impact of this approach on lung function, which was discovered during animal models.